Swipe on, creamy lip colour with the Note Long Wearing Lipstick. It protects, defines and colors your lips for a long time with its special formula that contains Macadamia Oil and Shea Butter. Macadamia Oil and Shea Butter, nourishes lips, balances palmitoleic acid level and protects lips from drying and cracking by giving it intense moisturization. This vitamin E, A and D rich formula also helps in the prevention of fine lines on the lip contour and promotes cell rejuvenation. About the Brand: NOTE Cosmetics is your one stop destination that aims to enhance your beauty with their wide range of cosmetics. Ranging from high end beauty products for all, this brand comes with a stunning luxe makeup line to capture and embrace the art of beauty without compromise. Explore the entire range of Lipstick available on Nykaa. 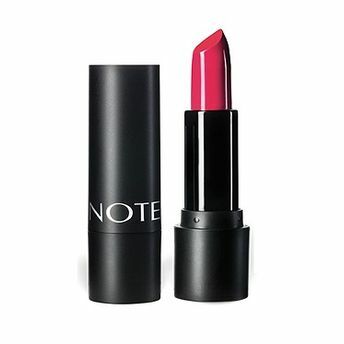 Shop more Note products here.You can browse through the complete world of Note Lipstick .Alternatively, you can also find many more products from the Note Long Wearing Lipstick range.